The complex has it's own swimming pool and sun terrace with loungers, umbrellas and a pool bar. Rooms feature private bathroom with shower and hairdryer and a kitchenette with 2 electric rings and fridge. Air-conditioning is available for a local charge. 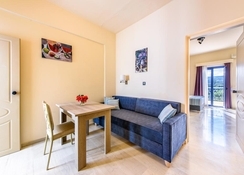 The Kleanthi Apartments are situated on the outskirts of Gouves, so they’re handy for getting about yet tend to stay quiet around the complex, making this property a firm favourite with returning guests. 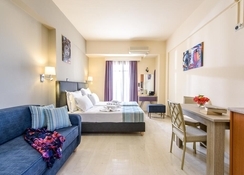 The comfortable apartments are what you’d expect from a Greek hotel and feature air-conditioning, hairdryer, shower, kitchenette with 2 electric rings, a fridge and balcony. ** Please note some facilities are at a local charge. Peaceful location with views of the sea and surrounding olive groves. Entertainment within the complex on barbecue nights when there's Greek music and drinks.